There is no problem on Earth. Only contrast. The totem of the Crow is a gateway between light and dark and the freedom to go in either direction. She is a neutral space rather than an active energy and her lesson is about learning how to steer your life in the direction you want it to go. Crow Medicine is a witness to all explorations and holds extreme paradoxes in her neutrality. You find her messages at the edges of shadows, shorelines, and the boundaries where textures shift and contrast. She is where differences begin. Contrast is the only way to have a physical experience of life. Without contrast we would be two dimensional events, compulsive and inevitable. Crow medicine is the black void of neutrality that holds all contrast and all choices. She carries profound impartiality to any situation which allows the depths and heights of our choices. Crow knows that under every situation, all is well. It is the act of choosing that allows us to experience for ourselves the process of coming into harmony with the primary law of Love at the base of all that is. Love is the quantum material that comprises The Great Mystery of being. It is the space and freedom to try. No matter what happens, there is no event larger than the space of love that contains it. All discord will eventually return to harmony. Differences are not obstacles keeping us from what we want. Differences are the materials we use to sculpt into existence what we want the world to be. Everyone gets to sculpt and create as they see fit. This is the law of Crow. The Cawing of the crow clears a space of any built up frustration. She is the chimney sweep and the transporter of energy. Like the audible equivalent of a volcano or an earthquake, cawing is a cleansing, clearing sound that releases buried tension in a neighborhood. A murder of crows could very well be talking about you if you have a build up of unaddressed frustration boiling in your subconscious. People with Crow medicine find great relief in articulating a situation audibly, often with litteral clucks and caws. Articulation of frustration is most effective when a person refrains from using language and instead uses non-verbal sounds in an explosive way. If you feel your subconscious is becoming a pressure cooker, crow invites you to crouch and caw to break the strain. When you locate the caw sound in your throat and head you clear frustrations you do not have time to drag through the brain and analyze. 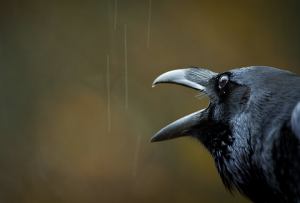 If you are too shy to channel the sound of Crow, tuning your ear to that crow on a rampage as you walk down the sidewalk can also clear your subconscious plate tectonics. If you are obsessed with a frustration Crow also suggests you take a piece of paper and make a list of what is bothering you on one side. Then on the other side describe the opposite. Placing your thoughts on paper creates a contrast for you to see your perspective clearly. Finding the positive attributes to the list of complaints helps you locate new perspectives and lifts you out of the current of negativity. Crow medicine teaches us to not pick and peck at the things you do not want. Fly away from that frustration to the experiences you do want. Crow holds the space for the freedom to move closer to or farther away from alignment with our true self. By the gift of the space she offers we are free to investigate any strange substance or intense relationship. We are free to engage the world as we choose. It is our act of choosing that determines the nature of our experiences. 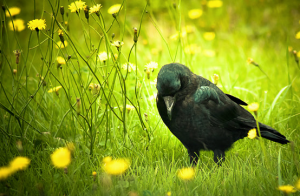 The gift Crow offers is the freedom to explore confusion and find clarity. When you accomplish this, you know without doubt that it was you who found your way. The law of crow medicine reconciles the paradox of unfathomable violence occurring simultaneously on a planet with indescribable joy. Such contrast confounds the human spirit and sends us into despair. Crow holds the space for that despair so we can experience the ultimate truth of life for ourselves. The ultimate truth of life is the Law of Love. How do you feel about the dark? Does it scare or excite? Crow asks you to recognize the darkness for what it is- a thing as yet unknown, made of love. The attitude with which you approach the unknown has everything to do with what you get from it. Entering the darkness with a fear of pain will maintain the darkness and increase the pain, driving you to locate your inherent guidance system out of the dark. Recovery is ultimately the true destination of all our pain, but Crow’s medicine shows that you are free to take as long as you like exploring its opposite. You are also free to stop exploring pain and deliberately seek joy. Crow is the holder of the Laws of Nature which often differ from the laws of man. The laws of man are negotiable. The laws of cosmic nature are not. If you climb a mountain and fall into a crevasse, that situation is between you and the Laws of that rock. There is no negotiating with the rock. There is only negotiating the limitations of your mind to find a way through the reality of what is. But despite the intense frustration that rock might cause, Crow teaches that the fundamental law underlying all laws is the Law of Love. Love is what all things emerge from and it is what all things return to. It is your choice how far away you venture from this ultimate reality. This freedom to chose is Crow’s medicine. When we venture away from the Law of Life we are beset upon by illusions. The space that Crow holds open is the eternal option to dissolve illusions and experience what is real. This medicine also reminds us that what you send out will be returned to you with a speed and velocity times ten. Whatever you give, you are inherently asking to receive even more of. The space of Crow medicine does not advise you. It is for you to learn how to get the responses you want from the world around you. Crow’s message is to live inside the ever expanding mystery of our imaginations and let no external excuse limit our ambition. What we can imagine we can call into being. If you are finding a situation too difficult to grasp, Crow invites you into a meditation of the Void. The Void is the place of no-thing where you can neutralize the charge of your limited opinions and open to a whole new reality. Differences are not a problem. Contrast is not a problem. Nothing is in the way of you living the life you want except where you place your attention. Contrast clarifies how you wish to grow and change. Practicing the art of finding options expands your life. The outside world is negligible and arises from the power of our imagination. Physical matter emerges from vibrational energy. No material in this world was created outside of a quantum process of vibration inherent to that object. Whether it is a tree, a building or a person, the vibration that created physical matter is an opinion of vibration, a singular perspective. It is only through the experience of what we do not want that we can clarify what we do want. It is good Crow medicine to clarify what we want. When we clarify what we want the universe expands to embody our every new desire. 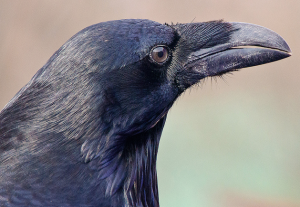 Crow tells us that it is our desires that are causing the Universe to expand. The differences between you and other people are, in fact, the only way for you to clarify what you like and don’t like. It is not a problem that others are not the way you are. Differences are not a threat to your survival when you maintain a connection with the eternal being that is your true self. Only in a background of darkness can we know the exquisit nature of light. Crow medicine is that background holding both light and dark equal in value and available as preferences. If Crow medicine has flown into your life, she speaks of a looming potential to explore and an arrival of something unlike you’ve ever known before. She is an invitation into what could be and an invitation to expand your imagination.